Step 1. 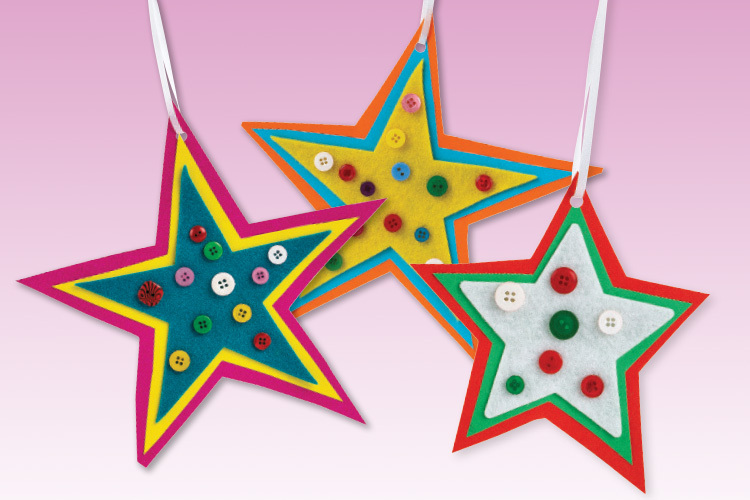 Glue a pre-cut felt star onto a piece of cover paper. Step 2. Carefully cut around the star leaving a 1cm border of the cover paper. Step 3. Glue this shape onto another piece of cover paper. Again, carefully cut around the star shape leaving a 1cm border of the cover paper. Step 4. Glue on buttons to decorate using Supertac. Step 5. Punch a hole at the top of the shape and thread through with ribbon or string to create a hanger.